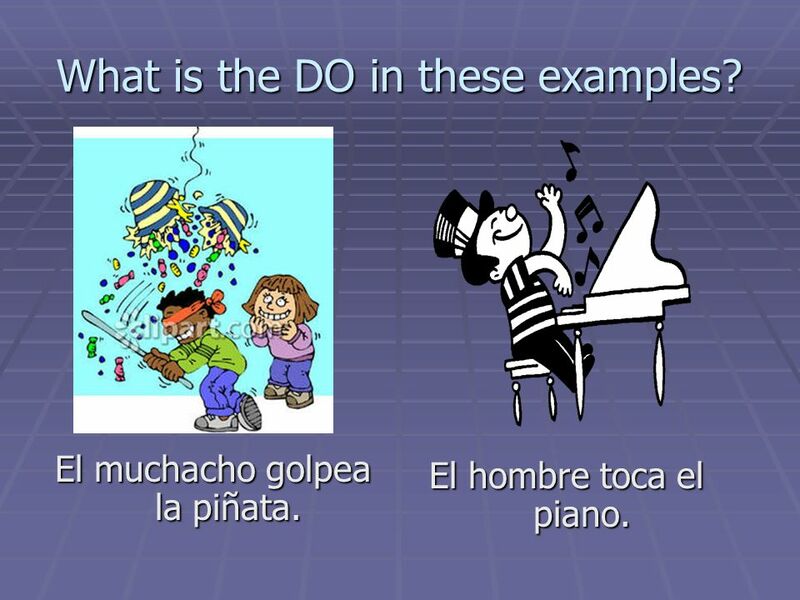 2 What is the DO in these examples? El muchacho golpea la piñata. El hombre toca el piano. 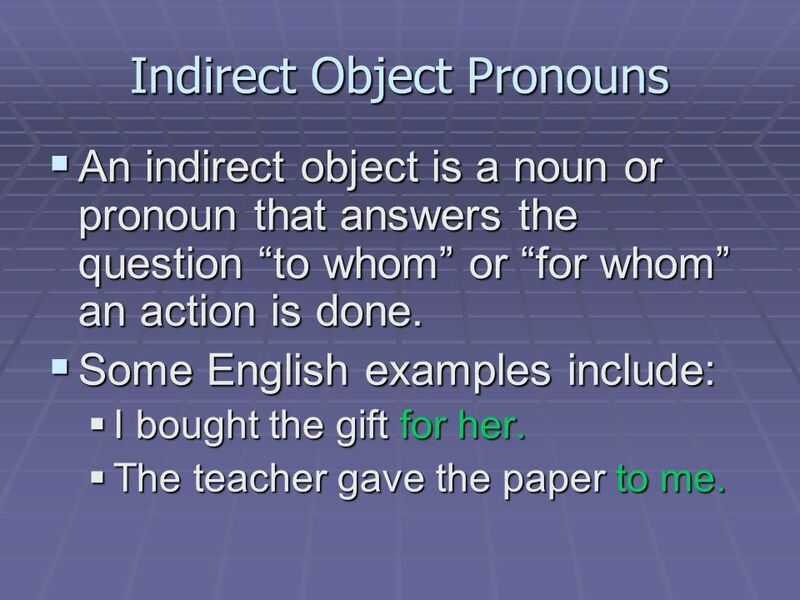 An indirect object is a noun or pronoun that answers the question “to whom” or “for whom” an action is done. Some English examples include: I bought the gift for her. The teacher gave the paper to me. 6 Indirect object pronouns are usually placed before the conjugated form of the verb. In negative sentences the pronoun is placed between “no” and the conjugated verb. Martín me compra un regalo. Eva no me escribe cartas. 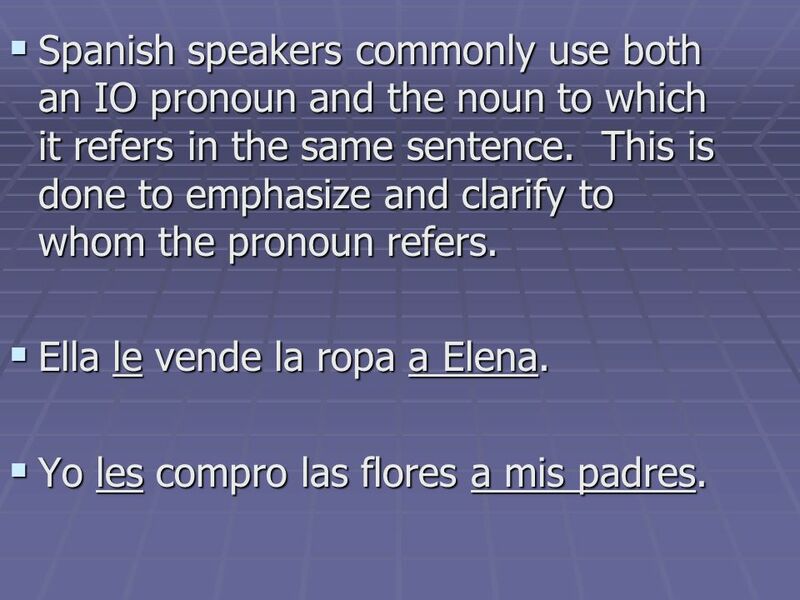 7 Spanish speakers commonly use both an IO pronoun and the noun to which it refers in the same sentence. This is done to emphasize and clarify to whom the pronoun refers. Ella le vende la ropa a Elena. Yo les compro las flores a mis padres. 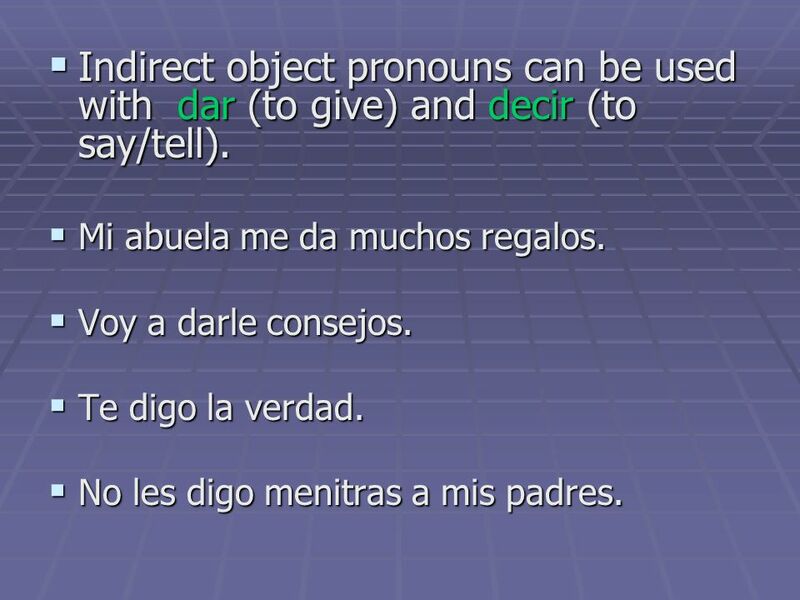 8 Indirect object pronouns can be used with dar (to give) and decir (to say/tell). Mi abuela me da muchos regalos. Voy a darle consejos. Te digo la verdad. No les digo menitras a mis padres. 9 Try these on your own. Fill in the blank with the correct IO pronoun. 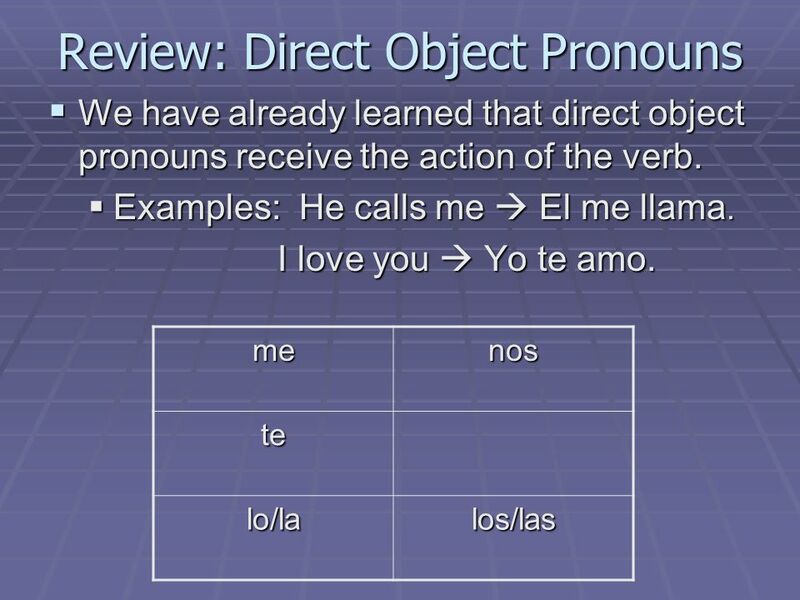 Descargar ppt "Review: Direct Object Pronouns"
CONTENT OBJECTIVE I will be able to replace INDIRECT OBJECT NOUNS with INDIRECT OBJECT PRONOUNS. LANGUAGE OBJECTIVE I will be able to use the Indirect. 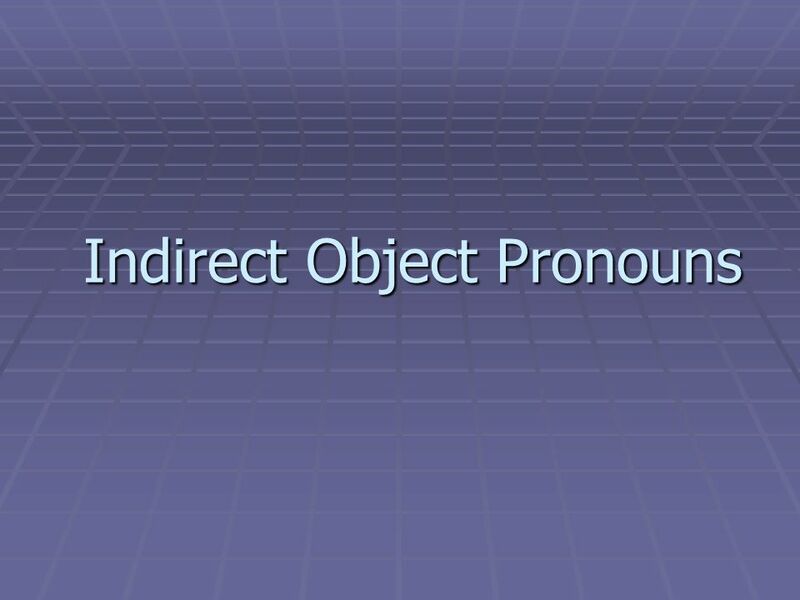 Direct Object Pronouns p The direct object (DO) is the person or thing in the sentence which directly receives the action. 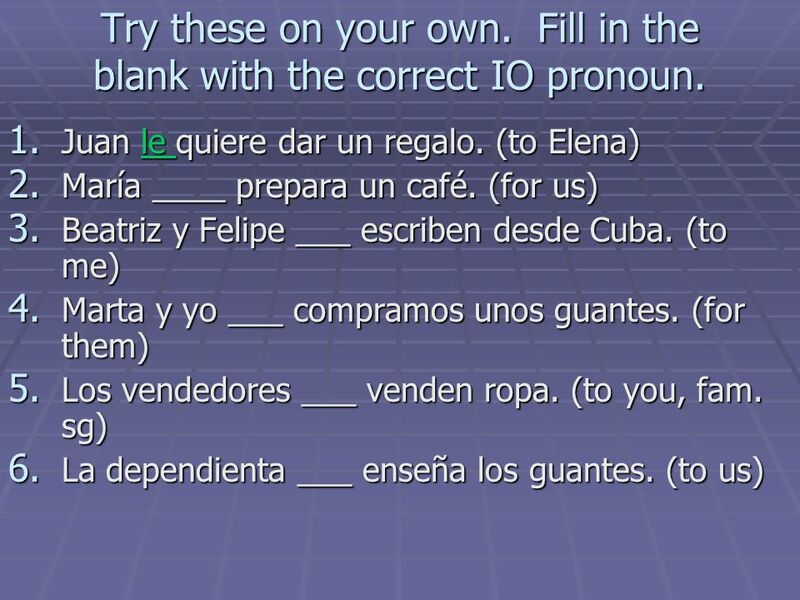 DOUBLE OBJECT PRONOUNS. Vamos a repasar… The DIRECT OBJECT is the thing that is verbed in a sentence. It answers the question, Who or what is receiving. Direct Object Pronouns Direct Objects Diagram each part of these English sentences: I want that skirt. I bought some shoes. What is the subject, the. PARTE 1 LOS OBJETOS DIRECTOS E INDIRECTOS. 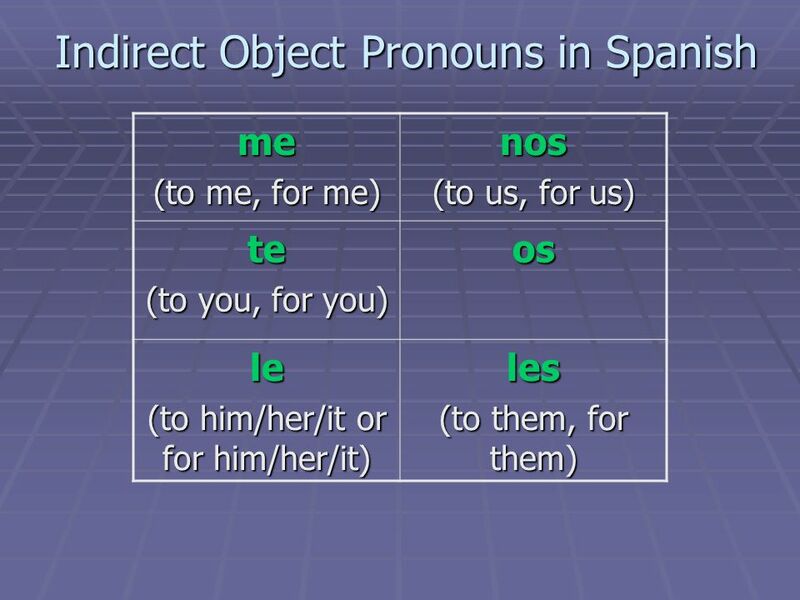 DIRECT OBJECT PRONOUNS VS. 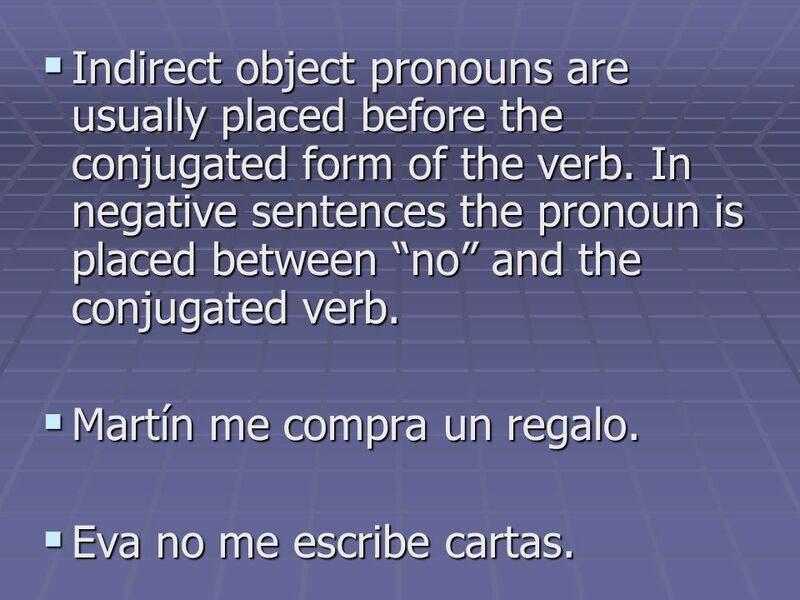 INDIRECT OBJECT PRONOUNS Habla con otra persona para ver qué es la diferencia entre.